You can use your IR remote to control Codey Rocky. Customize your IR remote to be your Codey Rocky control. 2. From the pop-up Extension Center page, click "+" to add IR Remote blocks. 3. Go back to Edit page. You can find IR Remote category added to the block palette. Let&apos;s try out the new IR Remote blocks. We will make a simple project to control Codey Rocky with your IR Remote. 2. When up arrow button is pressed, we want Codey Rocky to move forward. We need to a if () then () block from the Control category, a IR Remote () pressed? 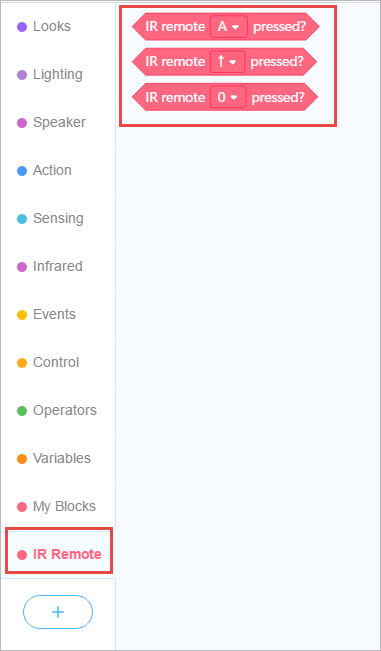 block from the IR Remote category, and a move forward at power ()% for () secs block from the Action category. 3. When down arrow button is pressed, we want Codey Rocky to move backward. We need to a if () then () block from the Control category, a IR Remote () pressed? block from the IR Remote category, and a move backward at power ()% for () secs block from the Action category. 4. When left arrow button is pressed, we want Codey Rocket to turn left. We need to a if () then () block from the Control category, a IR Remote () pressed? block from the IR Remote category, and a turn left at power ()% for () secs block from the Action category. 5. When right arrow button is pressed, we want Codey Rocky to turn right. We need to a if () then () block from the Control category, a IR Remote () pressed? block from the IR Remote category, and a turn right at power ()% for () secs block from the Action category. 6. Add a Control block forever. 7. Click "Upload" to upload the program to Codey. 8. Press the buttons of your IR Remote and see how Codey Rocky moves.